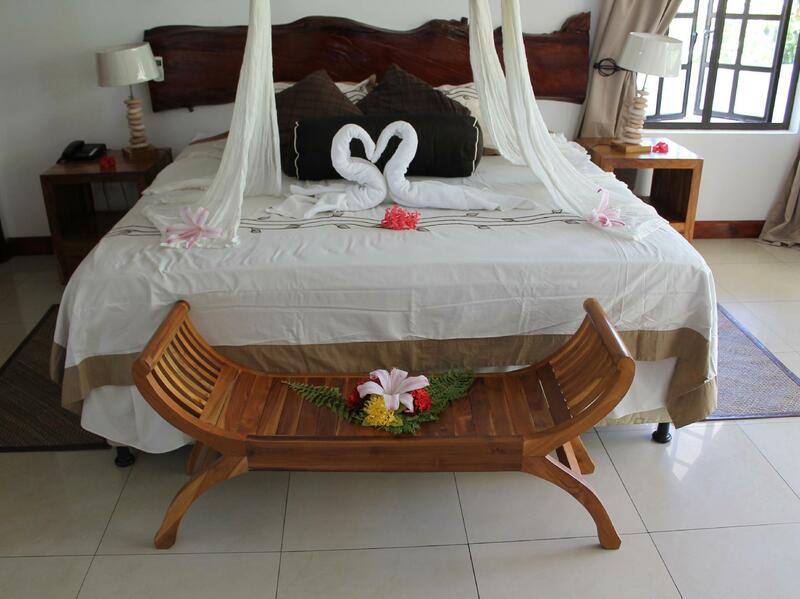 ﻿ La Digue Self-Catering Apartments Kepulauan Seychelles. JIMAT di Agoda.com! Ada soalan mengenai La Digue Self-Catering Apartments? Ketika melawat Kepulauan Seychelles, anda akan merasa seperti di rumah di La Digue Self-Catering Apartments, yang menawarkan penginapan berkualiti dan perkhidmatan hebat. Pusat bandar hanya jauhnya dan boleh sampai ke lapangan terbang dalam tempoh minit. Dengan lokasi yang mudah, penginapan ini memberikan akses mudah ke tempat yang anda perlu lawati di bandar. Menawarkan tetamu perkhidmatan yang unggul dan pelbagai kemudahan, La Digue Self-Catering Apartments komited untuk memastikan penginapan anda berada di tahap seberapa selesa yang mungkin. Untuk keselesaan dan kemudahan tetamu, hotel ini menawarkan dapur, simpanan bagasi, Wi-Fi di tempat awam, penjagaan kanak-kanak, restoran. La Digue Self-Catering Apartments mengandungi 6 bilik yang dihias indah dan menawarkan televisyen skrin rata, bilik larangan merokok, penyaman udara, meja, beranda/teres. Hotel ini menyediakan kemudahan rekreasi yang baik seperti taman untuk membuat penginapan anda benar-benar tidak dapat dilupakan. Dengan lokasi yang ideal dan kemudahan sepadan, La Digue Self-Catering Apartments sangat memuaskan hati. I only gave 3 stars for cleanliness as the plates in the cupboard were covered in dust. Not sure if the previous tenants didn’t use the plates but the cleaners definitely didn’t check the cleanliness of the plates. Additionally the fridge initially didn’t work but the manager of the complex sent an engineer who fixed it at the second try. Our apartment had a big balcony on which you could have your meals or just relax. In the downstairs area of the complex there was a pizzeria and another restaurant. We tried the pizzeria once for lunch and their pizza was very good and not too expensive. You can hire bicycles directly from the site for €6/ day per bicycle. Prices are the same all over the island for bicycle hire. You can get Wi-fi access for €10 per stay (not per day) but there is also a hotspot at the square near the apartment which can be used for free but not unlimited usage. 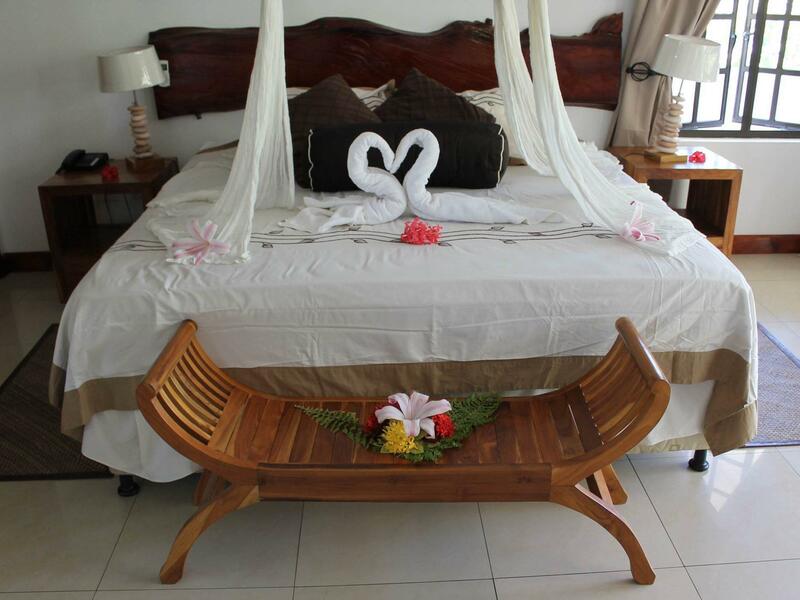 Enjoyed our couple of days stay at La Digue self-catering apartments! The place was close to the jetty and easy to find which was a definite plus as we I were travelling with a 2yr old. Friendly and efficient service by all staff and excellent breakfast. Only thing that would have topped it up was for WiFi to be included in the price. All in all I would highly recommend to friends and family. The accomodation offers a breakfast from 7:30a.m. which is a good start for the day. The breakfast is good but few options like: fresh fruits, toasts, eggs, coffee, tea. You can rent bicycles for 100 rupies/day. The lady at the reception is very nice and elegant and speaks english perfectly, and everybody is very helpfull. The room was nice and big, and we had a big balcony, because the room was on the corner. The only thing that was disaponting is that lizards got in the kitchen through the window, and though, we always left it closed when not in, the cleaning lady opened it and left it so. We had to struggle almost every evening to make the lizards go out. A mixer and a microwave would have been good in the kitchen. The bathroom looks great. Our stay was great, but for 100% self catering the kitchen was very small. The balcony was the place to eat (the weather is perfect al year round so no problem there!) but I would have liked a coutch in the room so you don't always have to it on the bed). The kitchen was tiny but had a big fridge/freeze, only two hot plates to cook on and a small grill, steamcooker (for rice), microwave and two kinds of toasters for bread. Besides the the electricity socket for the fridge there was only 1 other.... so you had to choose from al those machines or pull the fridge... And no working space. So if you're just looking for a space with a great big bedroom and an nicea bathroom where you can prepare your own breakfast and heat something in the afternoon or evening. This is a great place. If you really want to be able to actually cook, have a living room area go for a proper apartment and not this studio. The staff is great. You have the posibility to have breakfast in the small restaurant and have pizza and pasta there in the evening. Don't go for the bikes they recomment but go for the place opposite the jetty. The last day we had to check out at 10 but we spent our afternoon at the swimming pool of their other hotel before we took the last jetty to Mahe (via Praslin) to catch our plane to Frankfurt. We had a fantastic time at the apartment - enjoyed the swimming pool use of Chateau de Cloud very much - very friendly staff and 5 star breakfast. Easy access to the ferry port (3 minutes walk), just accross the beach. We rented bicycles from the host - only paid 100 rupees per day - a must to do and we enjoyed every single minute on the Island. Unspoiled and perfect snorkeling opportunities - visited Mauritius 3 times but Seychelles far better and we will be going back there. Big room with great balkony decorated with taste. Very good equiped kitchen with more utensils than you can expect. Comfortable bed. Place has the best location on the islad. Room is large and beautiful, kitchen very well equipped. We enjoyed our stay.Arrived early from the jetty on a Sunday-got a welcoming fruit juice which was very much appreciated in the heat and humidity,room was ready.Spotlessly clean and sufficient cutlery ,crockery etc to make self catering possible.Only one wine glass but upon reporting this to reception was given a new one there and then.Check in and out effortlessly. clean, very nice staff, close to the 'center' ... but La Digue is so small you're close anyway! We had a very nice stay at the apartment. It is very well equipped, very comfortable, nice large terrace and close to everything . Helga the grant/concierge is very helpful and gave us a good overview of the island, activity and prestation when we arrive. Being a guest there means you have access to the swimming pool of the Chateau St Cloud, up on the hill. Very cosy and charming space. The walk/ride is worthwhile. The only downside and it is not related directly to the apartment is that there are no wifi connection, yes there is but it is approx 10€/hour which is way too expensive and only one"cyber cafe" available, well you're not there to surf some wight say. Also everything is closed on Sunday so be prepared!